You immerse your fingers in the warm sacred oil and sweep the golden liquid across your brow. Pungent myrrh incense billows and the air quivers with the words of an ancient prayer. Oil lamps flood the sanctuary with light and magic of the Near and Middle East. Anointed is a collection of articles and art, poems and prayers, recipes and rituals inspired by Mesopotamia, Anatolia, Arabia, and the Levant. The Deities honored within include Athirat, Asherah, Baʻal Hadad, Tiamat, Astarte, Yahweh, Ereshkigal, Atargatis, ‘Anat, Inanna, Marduk, Allah, Tanit, Nikkal, Cybele, Attis, Ishtar, El, and more. Cook a Sumerian dinner. Make a balm for dreams or a set of prayer beads. Celebrate the moon Mesopotamian-style or sing a hymn to a Hurrian Goddess. Learn about the indigenous polytheisms of the Near and Middle East and about their modern revivals. Let the joy of the Deities fill your life. 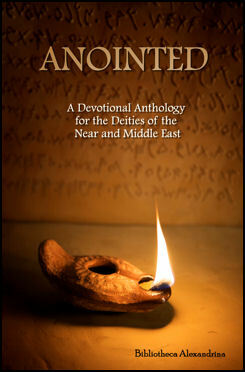 Anointed is the latest devotional anthology in Neos Alexandria’s Bibliotheca Alexandrina series, a collection of books dedicated to the Gods of Greece, Egypt, Rome, and the surrounding regions. It can be purchased in paperback format from Amazon, and Barnes and Noble. All of the proceeds from Anointed – as well as many of the other volumes in the Bibliotheca Alexandrina series – will be used to help promote the revival of the worship of the ancient Gods, with a portion of the proceeds given to a worthy charitable organization in their name. So, not only will you be getting a wonderful book about the modern worship of Asherah, Ba’al, Ishtar, El, and many other Deities – but your money will be going to do good work and help the revival of ancient polytheistic religions. ATTENTION Librarians, Teachers and Retailers: Anointed is also available at reduced cost for academic institutions, lending libraries (public and private) and retailers. Check our online store, or email baeditor@gmail.com with any questions. Congrats everyone! Can’t wait to read it, from Caroline Tully (currently in Cyprus – Land of Aphrodite). I have my copies, they came yesterday! It looks fabulous! I picked a page to start reading, and almost missed my bus to work! Great job, Tess and Bibliotheca Alexandrina!